Cary Grant and Jean Arthur in The Talk of the Town (top); Spencer Tracy and Katharine Hepburn in Woman of the Year (bottom). George Stevens' monthlong homage ends this evening on Turner Classic Movies. The screening films are the Fred Astaire-Ginger Rogers musical Swing Time (1936); three early 1940s comedies, Woman of the Year (1942), The Talk of the Town (1942), and The More the Merrier (1943); and the George Stevens Jr documentary George Stevens: A Filmmaker's Journey (1984). The More the Merrier is one of those movies I need check out again. Stevens was nominated for a Best Director Oscar, and so was the film, and leading lady Jean Arthur. Charles Coburn, actually one of the film's three leads, won for Best Supporting Actor. Joel McCrea didn't win anything, but he should at least have been nominated. The Talk of the Town is probably my favorite Jean Arthur film. Arthur, Cary Grant, and especially Ronald Colman are in top form in this comedy with a social conscience. I find The Talk of the Town one of the most unjustly neglected Hollywood movies of the '40s. Woman of the Year was the first pairing of Spencer Tracy and Katharine Hepburn. It's all about a working woman who must find a balance between her job and her husband. Some see it as dated and borderline reactionary; I don't quite agree. After all, the woman is allowed to have both a career and a husband at the end. Swing Time is considered by many to be the best of the Astaire-Rogers musicals. Personally, I prefer The Gay Divorcee and Follow the Fleet, but do check it out if you haven't already. The World War II housing shortage brings three people together for an unlikely romance. An escaped political prisoner and a stuffy law professor vie for the hand of a spirited schoolteacher. Biography of the Academy Award-winning director including dramatic color footage of WWII. 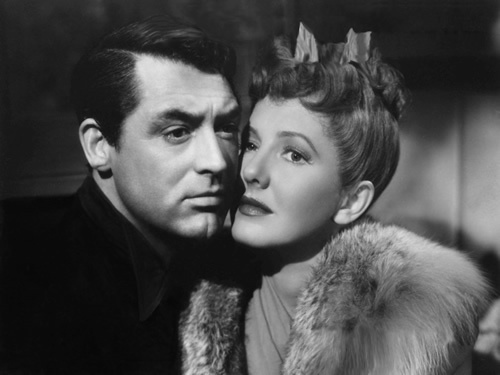 Jean Arthur and Cary Grant The Talk of the Town image: Columbia Pictures. Spencer Tracy and Katharine Hepburn Woman of the Year image: Metro-Goldwyn-Mayer.